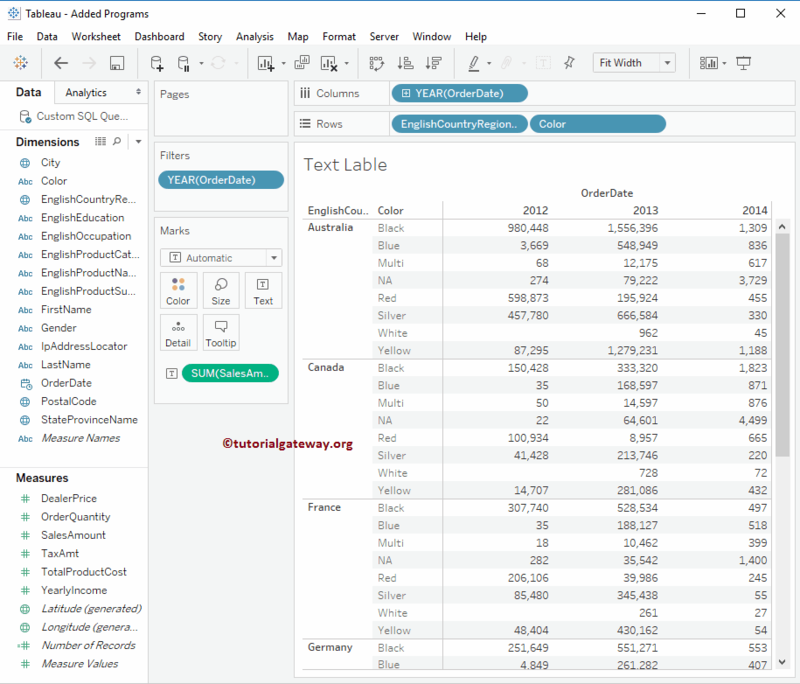 In Tableau, we can create Pivot data (also called as Text Labels, or Crosstabs) by placing one dimension in Column shelf, and another dimension in Row shelf. 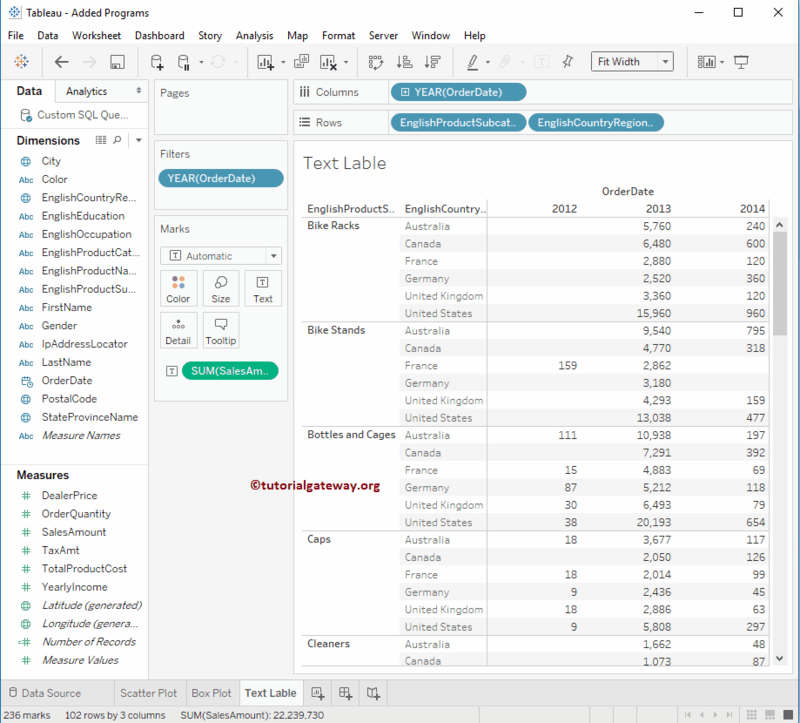 In this article, we will show you, How to Create a Tableau Text Label with an example. 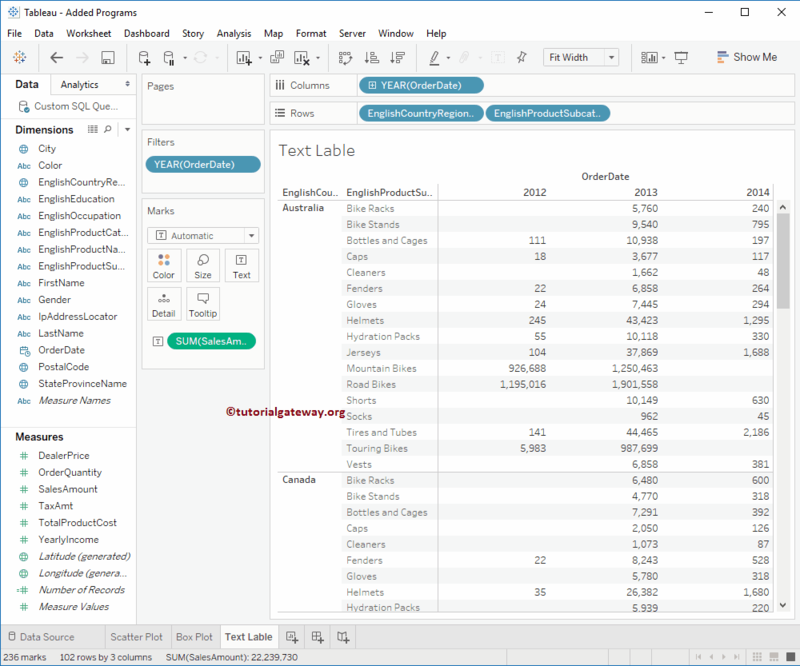 In this example, we are going to create a text label in Tableau. 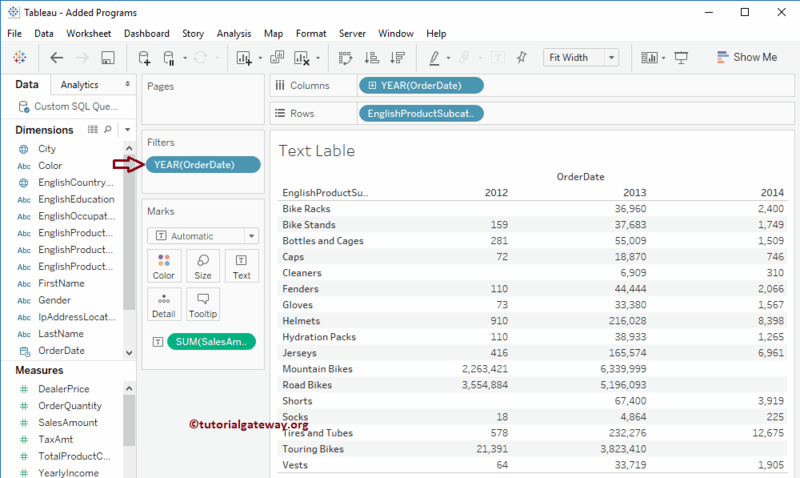 For this, first drag and drop the English Product Subcategory Name from Dimensions Region to Rows Shelf, and Order Date (Year) to Column Shelf. Next, drag and drop the Sales Amount from Measures Region to Text field present in Marks Shelf. 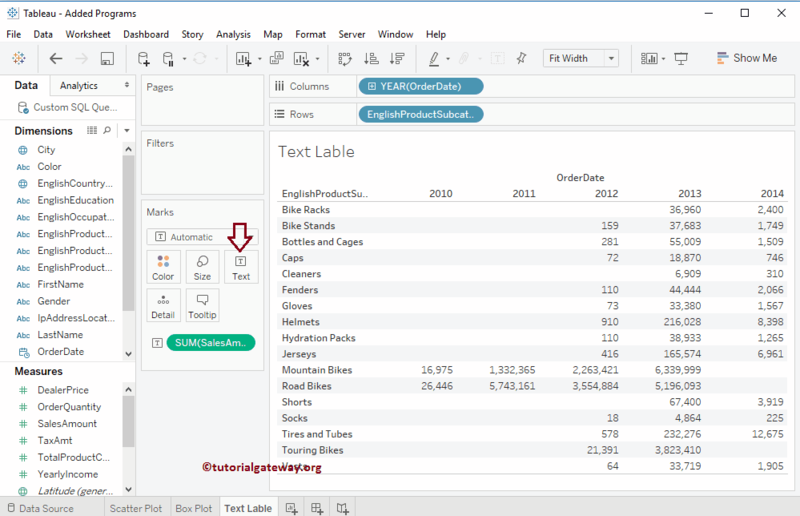 From the above screenshot you can see that, we don’t have much data for the year 2010, and 2011. so, we are excluding those years from the report by selecting those columns and selecting the Exclude option from the tool tip. 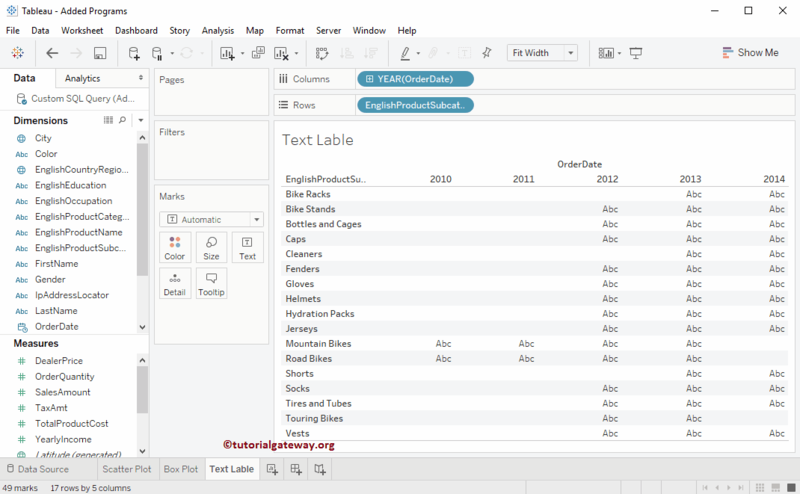 Next, drag and drop the English Country Region Name from Dimensions Region to Rows Shelf on the left side of the product subcategory. Above screenshot will show you the complete cross tab report. Let us interchange the positions of the dimensions in Row shelf. 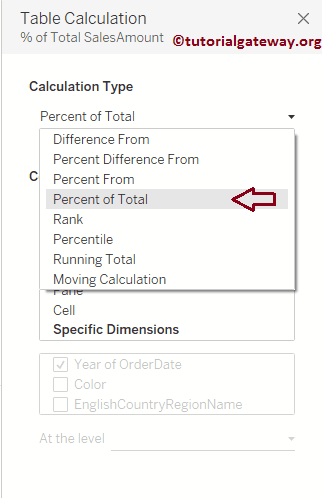 In order to add the table calculation, please select, and right-click on the Sales Amount measure (change as per your requirement) will open the context menu. here you have to select the Add Table Calculation option as shown below. 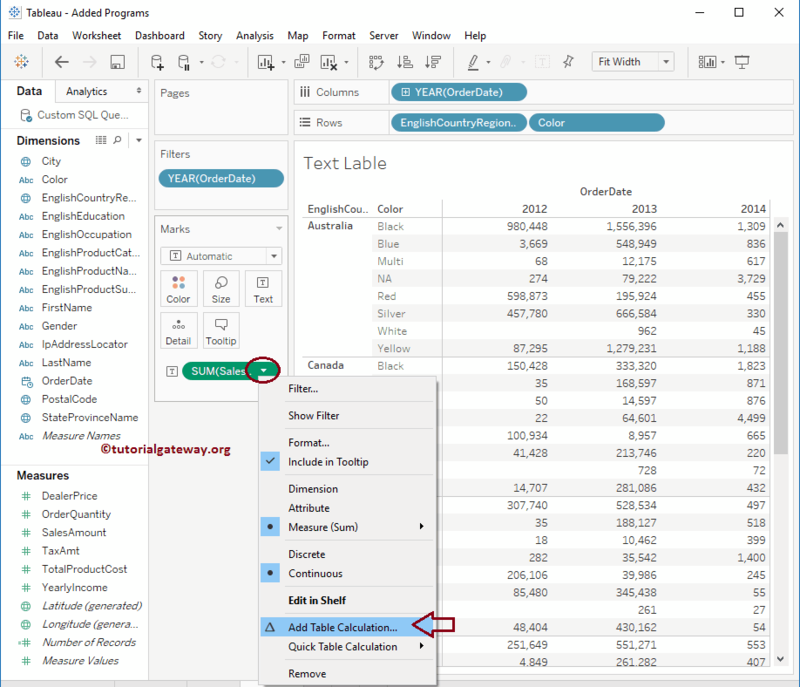 Once you select the Add Table Calculation option, a new window called Table Calculation will be opened. Here we are selecting the Calculation Type as the percent of Total, and Computed by Table (crosstab). Remember, we will discuss the Table calculations in another article and here we will focus on crosstabs report only. The following screenshot will show you the Crosstab report along with the Percentage total. As you can see, we got the maximum percentage of sales in 2013 compared to 2012, and 2014.